To engage visitors so they stay on your site. Content can be a blog, a news story, a brochure, a whitepaper… any piece of collateral that adds value to your website for the reader. Once you’ve launched your new website, it’s not enough to sit back and bask in its glory. You now have to keep the site alive and the way to do that is through adding new content. Not everyone can write decent content. Take a look for yourself - it’s easy to spot who’s doing it well and who’s failing miserably. Even if you can’t pinpoint why, you’ll get a feeling that something is well written because it keeps your interest. Here's our step-by-step process that will help you write better. Step 1: Read - recruitment industry news, world news, backs of cereal packets…! Finding your next story can often be tricky. A good idea can come from anywhere and keeping your eyes and ears open to the next interesting theme goes a long way. Jot down any ideas no matter how unusual they may seem - often a good story comes from a tiny spark of an idea. To be honest, the chances of coming up with a genuinely new story idea are pretty low. It’s perfectly ok to Google your thoughts and take an existing idea as long as you add new opinions and new value. A good tip is to pick one reader and write your story for them. Identifying your business' buyer personae is a whole other subject but, essentially, if you can visualise a single reader, their pain points, their problems and which of these you can solve for them, you’re off to a great start. Step 3: Just start writing! The biggest hurdle - there’s nothing worse than a blank piece of paper and a deadline. The best thing to do is just start writing. Get your thoughts down and don’t worry if you’re not happy with every last word - you can always come back and edit later when you do a final check. Good campaigns will include a mix of evergreen and one-off newsworthy content. Hot topics that everyone’s talking about will attract readers - and you can then write follow-up pieces as part of your news series. There’s nothing to stop you carving up your content into bite size chunks. For example, you could create a series of three blog posts from one whitepaper. Look at what other businesses are doing, both in and outside the recruitment industry. Look at the detail too - length, format, links, images, calls to action... Check search engines too to see what’s ranking highly, and do look in the comments to see if there are any common themes that you can write about. Content length is often debated and there’s no right or wrong answer - longer pieces tend to rank better but you also need to keep your copy succinct. Try to understand search intent, or what your readers are actually looking for, and write content that answers their questions. Use free tools like Google's Keyword Planner to research the search terms that your post could rank for - and target your content to fit. Sounds obvious, but the best crafted piece of content in the world will never hit the spot unless you get it in front of your reader. This may take more effort than writing it in the first place. Make sure you and your teams share it on your social media channels. How you market your content depends on your assets and context. If you can post on a popular blog, you’ve got a captive audience. Guest blogging is a great way to get started, increase your visibility and tap into popular blogs’ social streams. 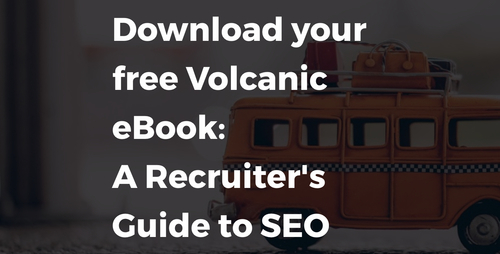 To get started on your content strategy, download our free Recruiter's Guide to SEO.